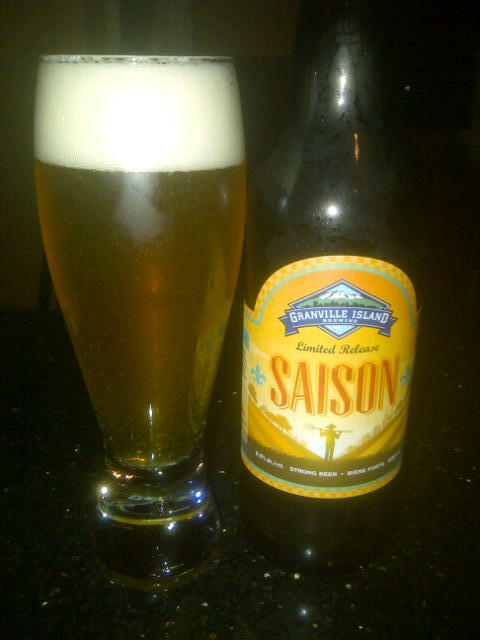 From Granville Island Brewing comes their Limited Edition “Saison”. This beer is a Belgian style farmhouse ale. The appearance of the beer is a pale yellow with a white head. The aroma is full of fruity, sweet and yeasty notes. Being a Belgian style there is a very different taste to this beer than what GIB drinkers will be used to. This beer has a ton of flavor with malts, fruit a mild sweetness and a decent hops bitterness. The beer comes in at an alcohol content of 6.5% and an IBU of 30. This beer is very bold for Granville Island Brewing and they hit it right on! This is a great beer. The bottle recommends a food pairing of “Tai curried muscles”. This entry was posted in Saison and tagged ale, belgian style, bitter, bitterness, bold, farmhouse ale, fruit, fruity, gib, granville island, granville island brewing, hops, hopy, malt, malts, malty, saison, sweet, vancouver, yeast, yeasty.